decision on how to get it replaced is also done in a practical manner. You do not want to end up making a choice because it is what a lot of people do or because it is the common option or the first one that presented itself to you. You want to assess your options carefully and decide on the best possible solution to your problem. However, with all the possible solutions available, it may sometimes be difficult to tell which is the best one. In the end, with the decision entirely up to you, you have to know whether you will be completely happy with whatever you decide. When it comes right down to you, you want quality service that is convenient and affordable. You will easily discover that, after you are done shopping around, San Diego Locksmith is the best option for your car key needs. But before we tell you why, let us eliminate all the other, more common options. In the end, by seeing why all the other options are not suitable, you will understand why we can give you what you want for your Toyota replacement key San Diego. The first instinct of any car owner is to default to their dealer when it comes to getting replacement keys. Logically, this makes a lot of sense. When your phone breaks, and you need a replacement part, you go to the one who sold you your phone. This is true for most other gadgets and appliances. The dealer is the one who is most likely to know the exact specifications needed. So going with your dealer is not exactly a crazy idea. But is it practical? Let us see. Your dealer mostly works with selling cars. True if you buy your car brand new from the manufacturer, they also specialize in the maintenance and parts for your car, but would giving you a replacement key be their priority? Considering they already have several non-key related services that they are offering, it might be safe to conclude that they probably prioritize their sales and other maintenance services more. And experience tells us that going to the dealer will result in you waiting a while before you can get your Toyota key replacement San Diego. Not to mention, they usually charge prices that are pretty high, considering all you need is a new key. You might have read some anecdotes of a few people on the internet who were able to pressure their dealers to giving them a replacement key for free by using all sorts of tricks, but these do not work too often. Bottom line: it is best to find a solution other than your dealer. Why not just any locksmith? who also sells cars and other car related products, a locksmith only really deals with keys and locks and other similar accessories. Given this, just about any locksmith should do, right? Wrong. Not all locksmiths are created equal. If you shop around, you will find that not all locksmiths can even do particular services you might need. Let us say your Toyota Camry runs using a keyless remote control fob system. There are several locksmiths that will simply tell you that they cannot help you. These are the ones who will tell you to go to your dealer. There are also locksmiths that will take their time getting to you. Either they have more customers than they can handle or they simply do not have the resources to serve you better. Either way, you lose. They might also end up charging you a heavy sum just to do a simple task like getting you back in your car. This is something you definitely want to avoid. You want to pay a reasonable amount for quality service. Is this possible? Yes, of course it is. You just need to go with the right locksmith, and not just any locksmith. When you call 7 Day Locksmith, you will immediately understand what professionalism means in the context of a locksmith. You will learn as much about how your problem can be solved by a locksmith, even just from the phone call. They will then give you a reasonable estimated quote. But you may think that the phone call might be deceiving. Maybe you are being tricked into availing of a service. So think practically. What is it that you need again? Quality service that is convenient and affordable. We provide top notch quality service as evidenced by our glowing testimonials. We have the best expert locksmiths who will solve your lock related problem in as short a time as possible. You need not worry about a lack of experience, as we only hire the best. And it is very convenient. We are open 24 hours a day, 7 days a week, and we go to wherever you may be in the San Diego area. 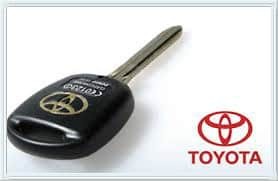 If you need your Toyota replacement key San Diego at two in the morning, then our mobile expert locksmith will be with you as soon as possible. And you want it to be affordable? Try the most affordable. You get a lowest price guarantee, making sure that you will not be able to find good service for the same solutions offered with any other professional locksmith service. Only we can provide these three things that will make you realize that you made the practical choice.